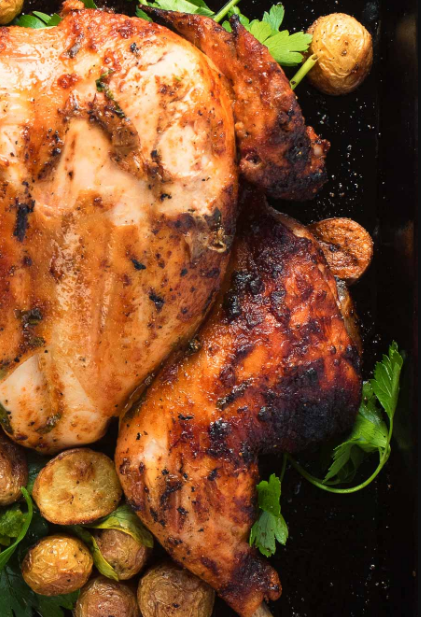 Portuguese chicken is a great way to add a new twist to your usual BBQ chicken. Combine all the ingredients except the chicken, lemon and salt in a bowl. You will be basting out of this bowl so choose wisely. Spatchcock the chicken. That's a fancy word for cut the backbone out of the bird, lay it out flat and push down hard on the breast to flatten it. Now you know. Salt the chicken liberally. Place it in a large ziplock bag and squeeze the juice of a lemon onto it. Seal the bag and place it in the fridge for about an hour. Light your grill and prepare it for indirect heat. You want it running pretty hot - about 400F. Place. drip pan under the grate. Drizzle a bit of olive oil onto the chicken. Rub the olive oil to coat the skin side of the chicken. Place the chicken, skin side up and grill, covered, for 10 minutes. Baste the chicken liberally with the marinade. Cook 5 minutes. Repeat a total of three times. Flip the chicken and baste the chicken a final time. Cook 15 minutes and then flip the chicken again. Continue to cook until the breast registers 165F using an instant read thermometer. Transfer chicken to a cutting board and let rest 5 minutes.